Britain is famous for falling apart at the first sign of snow and this week we really lived up to expectations. For some reason, nobody had bothered gritting the roads before the snow started falling. Perhaps whoever is in charge had engaged Michael Fish as a special weather advisor? 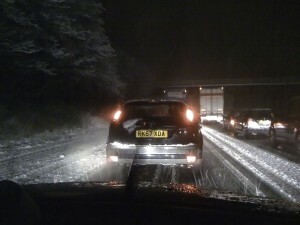 Whatever the cause, the SE descended into a frozen wonderland of stationary and abandoned cars. It took me five and a half hours to get from Hounslow to Wokingham and others I have spoken to fared even worse. But I did get home eventually and I suppose if everything worked like it does in Switzerland, we would all be bored and the papers would have nothing to write about. So what is it with the weather? 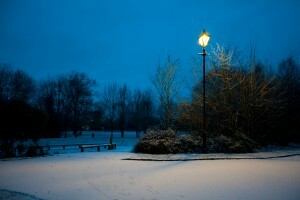 Most years we don’t get any snow, but this year the UK seems to be turning into Siberia. I managed to miss the big snowfall on Monday since I was in Madrid. But the kids have been very happy, school closed and lots of snow to play with. Off skiing again next weekend, so I think I’m going to need some beachtime as an antidote soon! Just returned from a very enjoyable week’s skiing in Chatel, France. Sunny every day except the third day, when it snowed. Perfect! 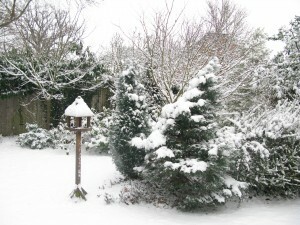 The snowy theme continued this morning when we woke up to a covering of snow at home. Although it had gone by 8am, at 7am when I left for work and took this picture, it was a rather magical scene.